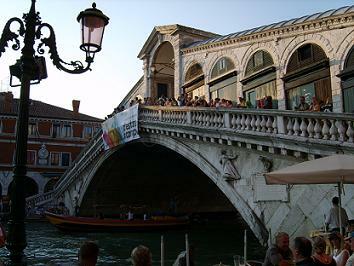 The Rialto Bridge is the oldest bridge across the Grand Canal and the most famous one in the city. It was build between 1588-1591 by Antonio da Ponte. The first bridge over the Canal was a pontoon bridge built in 1181 by Nicolo Barattieri. This bridge was replaced several times by wooden bridges. For a long time the Rialto Bridge was the only bridge over the Grand Canal. In 1854 the Accademia bridge was built. The third bridge over the Grand Canal is the ‘Scalzi Bridge’ near Santa Lucia train station. 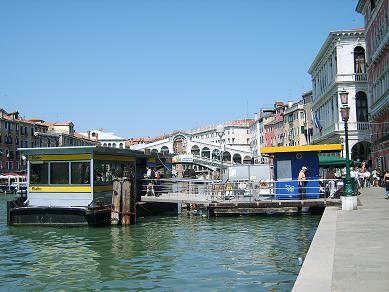 The public water bus (line 1) stops just before the Rialto Bridge. Line 1 operates between Piazzale Roma, Santa Lucia railway station, Rialto Bridge to St. Mark’s Square. It’s a scenic trip but most of the times it’s also crowded. 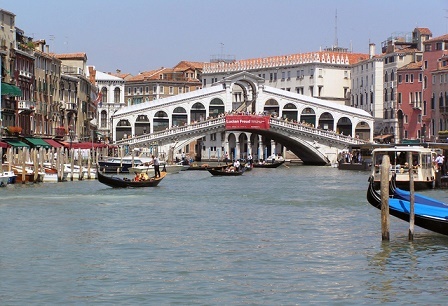 The journey from Santa Lucia railway station to Rialto Bridge takes 16 minutes; to St. Mark’s Square is 36 minutes.